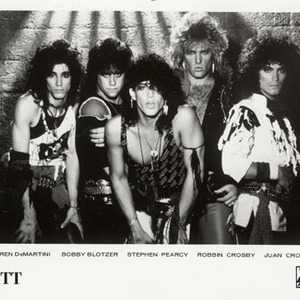 Ratt formed in Los Angeles, California, USA, and featured Stephen Pearcy (vocals), Robbin Crosby (guitar), Warren DeMartini (guitar), Juan Croucier (bass) and Bobby 'The Blotz' Blotzer (drums). They evolved out of '70s band Mickey Ratt, transforming into their present form in 1983, with a hint of pop about their brand of hard rock, similar to Cheap Trick or Aerosmith. They released a self-titled mini-album in 1983 on a local label, and struck up a close personal friendship with members of M?tley Cr?e. They made their breakthrough with their first full album, OUT OF THE CELLAR, which stayed in the Billboard Top 20 for six months. They toured with Ozzy Osbourne before joining a Billy Squier jaunt where they were apparently 'thrown off' because they were more popular than the headline act. Their subsequent output has seen them follow a familiar hard rock route with accusations over sexist videos contrasting with their ability to sell out concert halls and produce recordings that regularly received multi-platinum and gold discs. Detonator featured several songs co-written with Desmond Child and proved their most adventurous recording to date, though Crosby would depart after RAT 'N' ROLL. In 1993 Pearcy unveiled his new outfit, Arcade, confirming the dissolution of the band. The band reformed with a new album in 1999. Pearcy would leave the band not long after, unhappy with the album and chemistry. The band re-united in 2007 for a succesful tour with 80's rockers Poison. The band is touring in 2008 and hopes for a new CD-album is in the works minus original guitarist Robbin Crosby who died some years earlier brought on by a long and public battle he waged against drugs. Having gotten AIDs from sharing needles. His last television interview was with VH1's behind the music. Stating, "Don't feel sorry for me. Don't cry for me at my funeral. I've lived the life of ten men. I've been very lucky." Ratt released a new album in 2010 titled Infestation with Pearcy on the vocals.